Byatt explains the dire need to cut costs before enjoying his tuna tartare with a basil emulsion. PHILADELPHIA—As the fifth plate of his 10-course, $150 prix fixe tasting menu dinner was carefully placed on the manicured table in front of him, Kohl-Strauss Media Group CEO Tom Byatt reportedly told a colleague Tuesday that in order for the company to stay afloat in this adverse economic climate, staff layoffs would likely be necessary. "The fact of the matter is, our financial outlook is just not what it used to be, and if we want to keep the lights on, we're going to have to start making some tough choices," said Byatt, cutting into a piece of seared foie gras subsumed in a rich pheasant consommé. "Personally, I wish we could keep everybody. But unfortunately, I'm in the position of having to decide what the best direction for our company is, and I don't see any other option than reducing our overall cost structure and finding some way to trim payroll." "It's far from an ideal situation, but we have to cut corners somewhere," Byatt added as a second waiter arrived with a $110 bottle of Château Figeac from the wine cellar. "That's just a reality of our business model." Following a 20-minute period in which the executive and his colleague sampled a lobster broth hors d'oeuvre arriving compliments of the chef and listened to the maître d' explain how the lobster had been flown in from Maine that morning, Byatt reasoned that, although it pained him to say so, his company could definitely stand to lose about a dozen people in sales, and roughly another 15 or 20 in the marketing and production divisions. 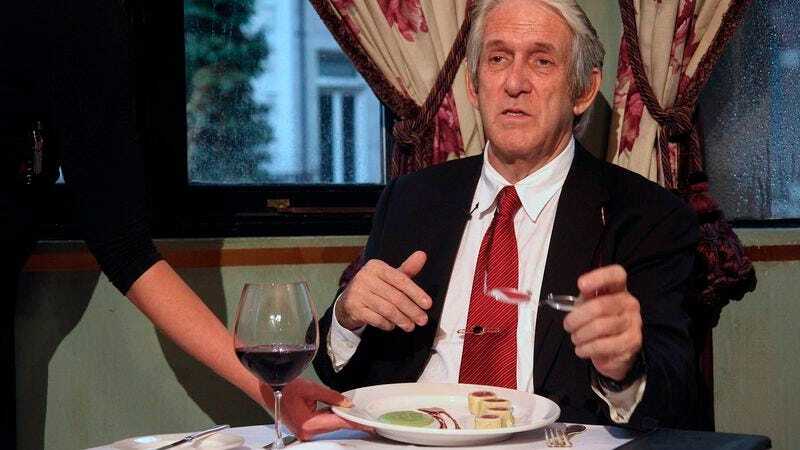 As the pair continued through lavishly designed plates of haute cuisine at a table situated near the window so that Byatt could keep an eye on his valet-parked 2011 Jaguar XJ, they discussed the unfortunate challenges of today's market and the tremendous stress placed on those at the management level to keep their businesses financially solvent. "As you know, nothing about these layoffs is easy for me," said Byatt, lifting his arms so that a waiter could gently sweep tiny morsels of gourmet artisanal bread off the table with a stainless-steel crumb comb. "I'm going to have to go into the office Monday morning and tell Mark to tell these people that they're going to be let go, all while trying to maintain employee morale. You can imagine how heavily that weighs on me." "But I think our remaining staff will certainly recognize everything I'm doing to keep us competitive," Byatt continued before deeply inhaling the aroma of a dry-aged bison filet mignon lightly coated in a truffle glaze and resting on a bed of imported fiddlehead ferns. "I just hope they appreciate the kind of pressure I'm under." After consuming his dessert courses of lavender crème brûlée and a caramelized brioche with a strawberry foam, restating his belief that payroll cuts are simply part of what a modern company has to do, and offering to have further talks on the subject of reducing company expenditures this weekend at his country house, Byatt thanked his colleague for working with him to "do right by this company" and snapped his fingers for the bill. "Oh, no, no, no, please," said Byatt, waving away his colleague's hand and putting down the company credit card. "I got this."